The miracle of a perpetually dynamic Universe is enabled when two opposing factors in an interactive state occur simultaneously. Compression and expansion are two opposing activities but when it takes place simultaneously, activity time is conserved and the dynamic state continues. The theoretical clue, lacking in Physics and Cosmology is the numerical algorithm that defines the threshold of simultaneously interactive states, which is also the key to gravitation phenomena. Newtons gravity constant and the fine structure constant are an approximation of precise axiomatic ratios that governs all phenomena in the Universe. Such an interactive activity among the sea of components in space is called a Vriti or vortex in Sanskrit and can be visualised as shown in the adjacent diagram. It is the most exotic process of interaction where dynamic space and cyclic time parameters are conserved totally at every instant. Therefore the dynamic aspect in space is sustained perpetually. Its esoteric mathematical formulation called the Perpetual Harmonic Oscillatory state (PHO) is again unique to Sankhya for it can be derived only through axioms. In Sanskrit it is defined as Aikantha, Athyantha, Atho, Abhavath state and collectively called the Tri-Guna interactive state or PHO.. It comprises the three cyclic activity states as Tama, Raja and Satwa corresponding to compressive collision, rebounding reversal and expansive separation leading to radiation. The foregoing activity occurs in three phases of simultaneous, resonant and sequential intervals of cyclic time, respectively. Maintaining the balance between the three modes of cyclic time is the key to eternal dynamism. Yoga is this state of balance where the PHO cyclic state is maintained in resonance and that state is Siddhi. PHO state in space pervades everything including our cerebral system which we term as consciousness. By relaxing and synchronizing with this field around us, our genetic cells get replenished to full potential in the Siddhi state. The component forming space is defined dimensionally. Each individual point form is called the Moolaprakriti or 'root activity' in Sanskrit. It can be visualised as the red cubic point between the eight larger blue cubes shown in the adjacent diagram. The blue cubes are only the agglomerate form of a large number of Moolaprakriti points in an interactive state and is called the Purusha state in Sanskrit. There are no equivalents to both states in Physics. ​​​Why is Sankhya theory, derived by Maharishi Kapilla 33000 (https://www.youtube.com/watch?v=Jk0tcc75_fk ) years ago, and given pride of place in chapter 2 of the Bhagavadgita, considered the acme of unified sciences? The prime reason is that only Sankhya theory defines and proves that the substratum of space is in an eternally resonant state. The mathematical ansatz is derived through axioms and defined by the principle of self similarity in an elementary field of components and named here as the Perpetual Harmonic Oscillatory state or PHO. Hence automatically the proof of unification is provided through axiomatic mathematics, since there is only one PHO state and it forms the source of all forces but occurring at different levels of matter / energy densities. Therefore it provides the fundamental reason for the existence of both detectable and undetectable phenomena, thereby including the domain of spirituality as the submerged energy domain into the logic of holistic science. Further it gives accurate proof for the unproven hypothesis in Physics that the nuclear state never decays . Read the brief write up here "Why is Sankhya correct ?". . 33000 years ago (proof is in video) should truly intrigue Scientists. Physicists hold the view that it is impossible to derive a complete and unified theory based only on axioms. Even more extraordinary, Sankhya's profoundness lies in its ability to derive all stable masses, from particles to galaxies, from first principles using the fundamental numerical axiom 1+1 =2. The point to be seen here intellectually is that axiomatic logic offers no choice. Not only is it a one-way street , it cannot even be rejected​. Science based on numerical axioms makes it perfect & predestined. 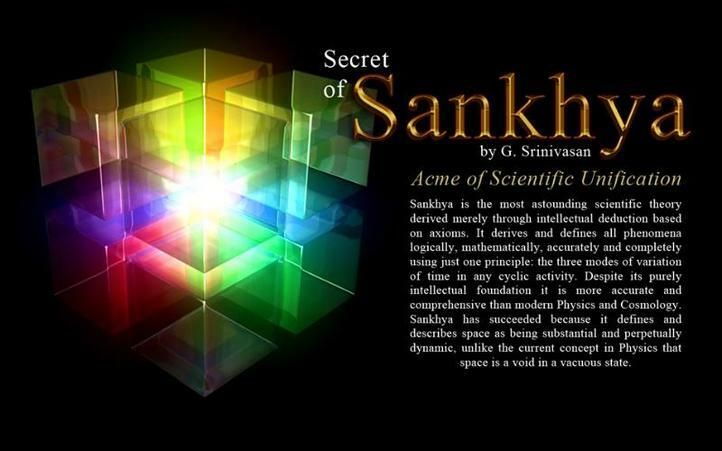 ​ ​​Swami Vivekananda lectured extensively on Sankhya as the the perfect science. ​There is no philosophy in the world that is not indebted to Kapila. Pythagoras came to India and studied this philosophy, and that was the beginning of the philosophy of the Greeks. Later, it formed the Alexandrian school, and still later, the Gnostic. It became divided into two; one part went to Europe and Alexandria, and the other remained in India; and out of this, the system of Vyasa was developed. The Sankhya philosophy of Kapila was the first rational system that the world ever saw. Every metaphysician in the world must pay homage to him. I want to impress on your mind that we are bound to listen to him as the great father of philosophy. This wonderful man, the most ancient of philosophers, is mentioned even in the Shruti: "O Lord, Thou who produced the sage Kapila in the Beginning." How wonderful his perceptions were, and if there is ant proof required of the extraordinary power of the perception of Yogis, such men are the proof. They had no microscopes or telescopes. Yet how fine their perception was, how perfect and wonderful their analysis of things! Sankhya Note for a brief listing while the details are in the second part of the book yet to be published. ​​As axioms cannot be disproved, it makes it invincible. Moreover axiomatic logic is governed by the principles of self-similarity and scale in-variance that remains eternally valid , which factor endows it with the mantle of divinity, thus unifying science and religion as the two sides of an axiomatic coin that emulates the human concept of GOD. Objectivity and intellectual clarity demands that axiomatically only one reality can exist which can be identified with any and all notions of human interpretations to aid understanding. The numerical content in Sankhya is in power index to base 10 that forms the axiomatic cycle of interactions logically but translators were never aware of it and misinterpreted an excellent derivation in Sanskrit. ​The present caveat in physics lies in its logic of derivation. An axiomatic process would establish that an elemental dimension of 1 linear unit with a symmetric volume of 1 cubic unit can only increase to 2 linear units thereby increasing the symmetric volume by 7 as 2 x 2 x 2 = 8 cubic units. There is no way to create 2,3,4,5,6 or 7 volumes as it needs fractional linear units which cannot be used without violating the concept of elemental dimensions. The axiomatic logic confirms that this disproportionate increase is only due the elemental state. Hence the cardinal principle evolves that scaling up has to be similar. In other words that the hidden seven volumes must be included in every larger derivation. ​This foregoing factor has never been explicitly recognised in theoretical or experimental Physics. The clue to it has been staring at researchers with the fact that there are a spectrum of 7 colours, sounds, etc. This axiomatic fact is established in the Hydrogen to Helium spectrum and the details are in the book. ​​ Detection is a relative process and hence elemental states can never be confirmed by measurement but only by axiomatic algorithms. Interactive harmonic states, that maintains the spectrum of particles, cannot exist unless the fundamental substratum comprises real components, in a dynamic state. Most important factor is that if objective logic is important then Physicists must undertake a paradigm shift to identify theoretically "that reality" that forms space & substitute the inane models it has created under many names. ​​​​​​​​​​​THE FOUNDATION OF SANKHYA IS BASED ON THE CONSERVATION OF NUMERICAL INTERACTIVE COUNTS. IN EVERY INTERACTIVE CYCLE. WHEN TWO INTERACTIVE COUNTS ACT SIMULTANEOUSLY, IT DISPLAYS A SINGLE COUNT CHARACTERISTICS AT THAT INSTANT, WHICH CREATES GRAVITATION OF HIGHER COUNTS TOWARDS THAT CENTER OF SINGLE COUNT. IT IS AN AXIOMATIC STATE OF RESTORING RESONANT BALANCE IN THAT CYCLE. ​To reiterate every numerical parameter, defining a stable state, like nuclear particle or a galaxy, are derived from fundamentals without any external inputs of any kind. The mass of proton, neutron, electron, neutrino, the quanta and many others have been derived from the first interactive count of 2, using the axiomatic principles of self similarity and scale in-variance. This is impossible in Physics today. See PHO.pdf to understand the details. ​Even more extraordinary is the fact Sankhyan algorithms solve the anomalistic puzzles mathematically, both in Physics and Cosmology. Dark matter, energy & para psychological spectrum manifestations are the simultaneous interactive states in space. The time interval between simultaneous interactions has to be zero and hence evades detection by counting but shows up as mass comparatively. ​Essential​​​​​ human activities sustains the living processes. The general impression is that spiritual processes are an aid to religious worship. On the contrary, it leads to releasing the abundant energy hidden in space as the para-psychological spectrum in the simultaneous interactive states, which raises the efficiency of living processes and is confirmed by mathematical analysis. Consciousness is the resonant response of genetic cells to the perpetual interactions in space. ​Finally, it is a theory that completely removes the concept of anthropomorphic dependence to explain the existence of any Universe. Sankhyan algorithms confirm with proof that any sea of elemental components will self organize through axiomatic processes to create the phenomena of manifestation always as a holographic process and it cannot be stopped. It is through an interactive elemental process of stress transfer that is defined as gravitation in Physics at the fundamental level. ​Axiom based mathematics can provide a solution to any and all problems in science as it follows a process of self similar and scale in-variant logic that is applicable only to a three dimensional or volumetric space. The second part of the book , not yet published, has the exotic mathematical proof , as an integrated flow of numerical solutions, arising from a single algorithm based on axioms. The contents link in blue at the end of this page will give an overview of how it is structured. ​IN OTHER WORDS SANKHYA IS THE ONLY THEORY ​THAT CAN DERIVE ALL THE STABLE PARAMETERS IN THE UNIVERSE FROM THE AXIOM 1 + 1 = 2 AND AS PROOF, THREE CARDINAL MASS VALUES OF THE NEUTRON, PROTON AND ELECTRON (AMONG OTHERS) HAVE BEEN DERIVED PRECISELY FROM NUMERICAL AXIOMS ONLY. PLEASE SEE PHO.PDF; FOR IT IS NOT POSSIBLE IN TODAY'S FUNDAMENTAL CONCEPTS IN PHYSICS. IT TEARS DOWN COMPLETELY THE INTELLECTUAL CONCEPTS OF LOGIC FOLLOWED IN SCIENCE. ​THE REASON: WHEN MANY INTERACTIONS TAKE PLACE WITHIN ONE CYCLE AS A SIMULTANEOUS STATE, NONE OF THE LAWS IN TODAY'S PHYSICS CAN BE APPLIED, AS THE VELOCITY OF STRESS TRANSFER BECOMES UNLIMITED. IN A CYCLE OF 10 COUNTS, RESONANCE IS AT 5 AS COMPRESSION AND BALANCE 5 AS EXPANSIVE MODES. IF FORMER 5 COUNTS BECOMES 4, THE LATTER CHANGES TO 6 & THE RATIO CHANGES FROM 5/10 TO 4/10 AND 6/10 , WHICH IMMEDIATELY TRIGGERS THE INWARD ACCELERATION CALLED GRAVITY. ​​For the same reason and logic, gravity is the strongest potential force, as it acts interactively but simultaneously at the very source, which state cannot be detected, as a photon can be. The proof of these statements has been verified practically in a gravity energy converter presently working at the highest efficiency, shown in the diagram below. IT HAS AN OUTSTANDING NEGATIVE LOAD ​ CHARACTERISTICS. ITS RPM INCREASES WHEN OUTPUT LOAD COILS ARE SHORT CIRCUITED. ​​Sankhyan algorithms can derive precise numerical solutions to any and every problem in science. See the 33000 year old Sankhya Sutra decoded according to the rules in the Pratisakhya. Gravity energy converter using 20 magnets .